Twitter is an American online platform and social networking site on which users can post and interact with messaged which are called as tweets. You can, of course, connect to people you know, and you can also connect with strangers who have similar interests as yours across the world. Twitter plays a major role in the marketing of different businesses. The web only business having revenue only through advertisements are the most benefited. Other companies including B2B and B2C can spread its product information on twitter and can get majorly benefited by reaching out to a major population. Twitter has also been used extensively in the field of education. You can get access to multiple links and information. Twitter analytics provides huge information that can help you create sensible tweets that will be useful for your target audience. It helps you to understand the insights of audiences including interests, education, marital status, buying style etc. Your twitter followers should be your correct target audience and twitter analytics will help you understand that better. With the comparison data, you can compare your followers with different factors like demographics, interests and consumer behaviour. Tweet impressions help you find the list of all your tweets and impressions. You can in fact see your individual tweet performance and a recent month performance. The engagement rate on tweets helps you understand the number of interactions you have on your tweet. You can also track your following rate in the follower’s dashboard. There are many ways to deploy a Java application, even when deploying to a specific cloud provider, there are various ways to deploy any application. By leveraging an Eclipse plug-in, this tutorial will demonstrate how quick and effortless it is to deploy a Java application to IBM Cloud in just a few clicks. The application in this guide will prompt the user to enter a Twitter handle and then calculate how influential that Twitter handle is by running an analysis of their account. It will also return other data such as the number of followers, a follower score, a retweet count, a retweet score, and the number of recent mentions. A list of the accounts most recently ten tweets is also displayed. If geolocation data is available for the tweets, then it is plotted and shown on Google Maps. Upon viewing the results, you can save the data to a database to store the account name and statistics summary. The contents of the database can be viewed from the home page of the application. Note: This plug-in will be renamed in the future from Bluemix to IBM Cloud. Click the Help menu, and the Eclipse Marketplace submenu. 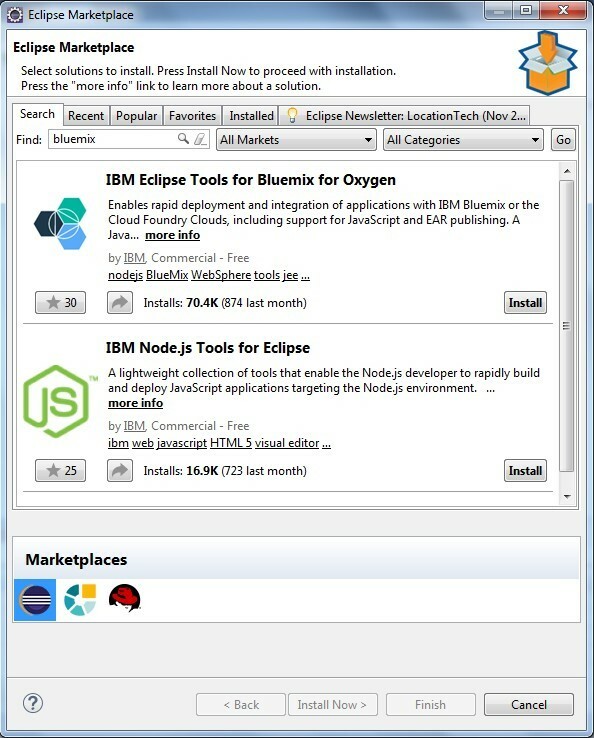 Install the plug-in named “IBM Eclipse Tools for Bluemix”. 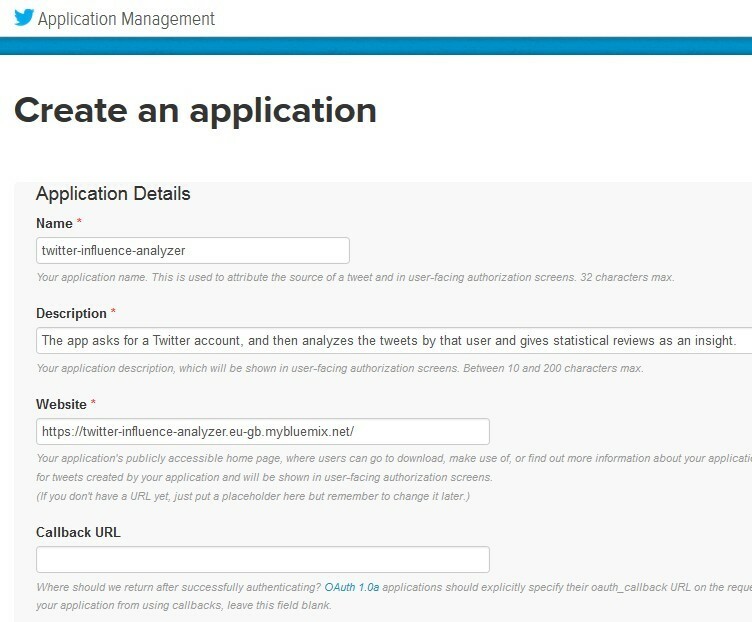 Navigate to the releases page of the bluemix-java-sample-twitter-influence-app application on Github. 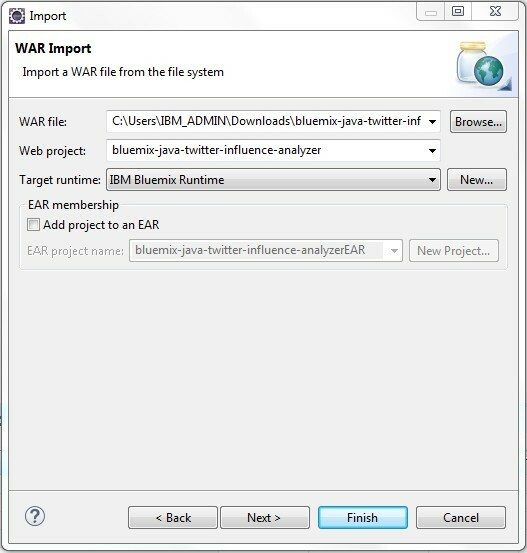 Find the “Latest release” tag and click the bluemix-java-twitter-influence- analyzer.warfile to start the download. From Eclipse, click the File menu, and the Import submenu. Scroll down to the Web section, expand that section, click WAR File, and click Next. Locate the local WAR file. Ensure the Target Runtime is set to IBM Bluemix. Click Next and then Finish. The project should be imported into your Eclipse workspace. This application uses some Twitter and Google Maps APIs, so we will need to register our application and generate a few API keys and tokens. The sample application will not work if the Twitter API keys and tokens are not set as environment variables. To access the Twitter API we will need to create a consumer key and secret as well as a access token key and secret. To do so we must register our application with Twitter. Sign into your twitter account and click on Create New App, fill out the form. When configuring your twitter application, it will ask for the fully-qualified URL to the website. This should match, exactly, the URL you plan to use on IBM Cloud. For example, if your IBM Cloud app will be located at https://twitter-influence-analyzer.eu-gb.mybluemix.net, then the Website text box should read that exact URL. After registering the app any API keys and token can be viewed under the Keys and AccessTokens tab. To get your API access token, click Create my access token at the bottom of the page and you will see the generated access token and access token secret. Be sure to jot down or copy the values for: Consumer Key (API Key), Consumer Secret (API Secret), Access Token, and Access Token Secret as we will need them soon. The sample application also uses the Google Maps v3 APIs. Google Maps APIs are open for developers and it is not necessary to register the application with Google. Navigate to the Google Maps API and select the GET A KEY button to create a new API key. Ensure you are in the Java EE perspective in Eclipse. In the bottom window section, select the Servers tab. Alternatively, you can click Window > Show View > Servers. Right click inside the Servers panel and select New, then Server. Select the IBM menu, then the IBM Bluemix submenu, click Next. Enter your login information for IBM Cloud in the email and password sections. Click Next. IBM Cloud will automatically validate your account credentials. Optional: Select the organization within your IBM Cloud account that you would like to deploy to. Right click on the Bluemix server and click: Connect. Right click on the Bluemix server and select: Add and Remove…. 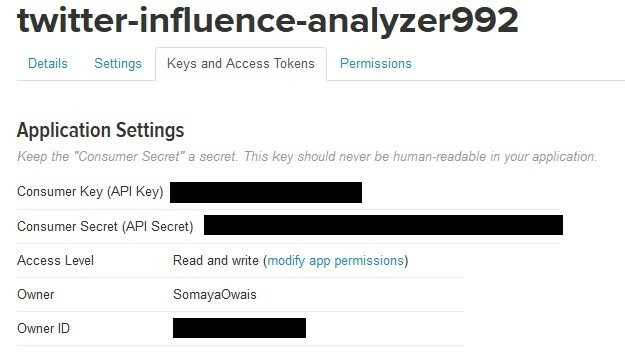 Select your Twitter Influence Analyzer project from the window on the left and click: Add. Enter a name for your app and select: Next. Enter the same subdomain that you used to register with Twitter. (e.g. https://twitter-influence-analyzer.eu-gb.mybluemix.net) click Next. Select the Add a service icon in the top right. Note that it the yellow icon. Search for cloudantNoSQLDB, and select the first option. Give it a name and select the Lite plan. Select Finish. This will create a free Cloudant service in your IBM Cloud organization. Click Next. Below is the home screen of the app. You can enter a Twitter handle in the text box and click the Analyze! button to see their influence. You can also view any records saved in the database by clicking on the View Database button. After analyzing a Twitter handle you’ll be able to see the influence analysis and their ten most recent tweets (plotted in Google Maps if geolocation is enabled for a tweet).